Everywhere in the above desc there is a "->", there is 1/4 fuel hose connecting the pieces. So I guess my question is ... what the best setup for minimizing fuel problems? Re: One tank, two engines, water separators and tee and check valves. Recommended setup? I mounted a separate filter for each engine on the inboard wall of the engine compartment aft of the engine. Then ball valve before the bulb. Only thing I would change is putting valve after bulb so running engine dry will take less time after closing valve. Never had much need for extra check valves. The fuel pump on the 9.9's is pretty good and just more to break down when the eventual ethanol finds its way in there. a. A separator is a waste of time for e-10 gasoline; it will either separate, in which case you will have several gallons of water and will need to pump the tank, or it won't. I've had separators since e-10 started (20 years) and have never seen one drop of water. Just get a good filter. This is different from diesel. Before e-10 they were a very good idea (I caught water then), and if you are going where you will switch back and forth they may help. b. Spend you money on a silica gel vent filter (H2OUT). These really work, keeping humidity out of the tank. I have tested several models, given them to other testers, and used them for 10 years. They really cut down on corrosion related carb problems. They also reduce volitiles evaporation, which improves operation and pays for the filter over time. Good for diesel too, but a no-brainer for gas. c. I have not run an engine MT in 30 years. That is urban legend unless the engine is going for long-term storage. for up to a month, even the engine manufacturers have changed their position. Attempting to run it dry only reduce the amount of gas in the carb, insuring that it will evaporate down and turn to gum. Leaving the carb full is better. Do use a good anti-corrosion additive (Biobor EB has tested best). 4. Bulbs. Good for priming after changing filter and for long absences. The filter should go several years/200 gallons. I change mine when it gets badly corroded, but seriously, how often do you change the filter in your car? Never? Gasoline does not grow bugs or sludge like diesel. Totally different. Thanks guys, I really appreciate you taking the time to reply. The separator I refer to is actually a filter/separator. The filter element is the Raycor 3214. I do get a smidgen of water when I drain the bottom of the filter into a clear glass cup. thinwater, I did purchase that silica gel vent filter (H2OUT) based on your recommendation. I will install this week. 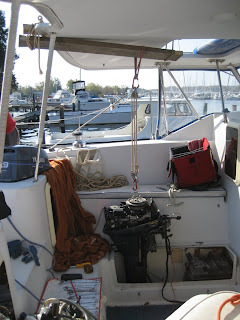 Do you also have a ball valve on the vent line to close it when the boat is not in operation? Also, I have a Racor #LG-100, Lifeguard Vent Line Overflow Preventer. I assume that the H2OUT should be "vent-side" of the LG-100? I'd like to change the setup to filters on each engine. Amytom said he mounted it on the "inboard wall of the engine compartment aft of the engine". And I think I saw a photo of thinwaters setup, but I can't seem to find that photo. Any photos handy? Also, as I will be buying new filters, what is recommended? I assume you are NOT running e-10 gasoline? You should never get water if running e-10. Ordinary gas, possibly. IF you can avoid e-10, that never hurts, though it is just a matter of making the proper adjustments. No, I would NEVER close the vent on the tank. It could over pressure and burst, as they are not built for that. Portable tanks and integral tanks are different, and are pressure rated. The H2OUT is enough. Regenerate the silica gel ~ 5 years. The stern grill on very low works well. Takes 20 minutes. Yes, the H2OUT should be on the vent side of the Lifegaurd, as high as you can get it. You need to keep the fuel out of the H2OUT. There is a tan mounting plate visible forward of the engine, but the filter must be removed to pull the engine. I'm going to redo the fuel line system tomorrow, with separate filters for each engine. While I'm at it, do you think it is a good idea to change to 3/8 fuel line instead of 1/4? The Yamaha fuel bulbs and line that came with the new engines were all 3/8. EDIT: my research shows that the 1/4" line is probably best. As for fuel, I am in Chicago and have no other choices than E10. I am diligent about getting Shell V-power high-octane at my local gas station that is very busy, then bringing it to the boat in 5-gallon jug. I mix it with the appropriate amount of Starbright and Ring Free. There was a rumor that Shell V-power high octane gas is ethanol free, but I cannot confirm that here in Illinois. No marina near me sells Pure Gas (no ethanol), and the closest station from Downtown Chicago that does is at least 70 miles. A problem that happened yesterday made me try and rethink my setup. I have brand new engines that have less than 50 hours on them, and my port engine now will not run unless full choke is on. When I close the choke after starting it, it dies. Fuel flow to the engine is not an issue, as I tested it running under an auxillary tank and the bulb is hard. It might be a dirty carb. Starboard engine is fine. I know how to clean the carb on the old engines, but this new one seems to be a bit different, and they are so tight in the well that I can't seem to come up with a plan to clean the carb flawlessly. It's days like these that I wish I didn't own a boat, and I just went sailing with other people. 1/4-inch line. Your burn rate is less than 1 gallon per hour, and all over size line does is increase permeation and leak potential. Don't worry about e-10. There are simple solutions. I have used nothing else for 20 years. The higher octane does NOT benefit a 9.9 outboard in any way. * Corrosion. Use a good additive. Biobor EB and Merc Stor-N-Start have proven effective in the lab. * Water. Use a silica gel vent filter (H2OUT). Your gas will stay dry. * If you do not get the vent filter (you should), then keep the tank full to reduce breathing. There is a school of through that says "the breathing water absorption is a myth," but my 35 years as a chemical engineer in the refining industry says they are not experts and have made false analogies from a very limited understanding of the chemistry. Forget Starbrite and Ring Free. The former doesn't do much for e-10, and the former is not needed with the 9.9. This is much cheaper than buying high test. Yup, dirty carb. The new one are not hard to get off--done it just to inspect as part of testing program. However, the problem is probably not gum but corrosion products. Look in the bottom of the bowl for small pits. The cure is Biobor EB. Very effective one aluminum corrosion.